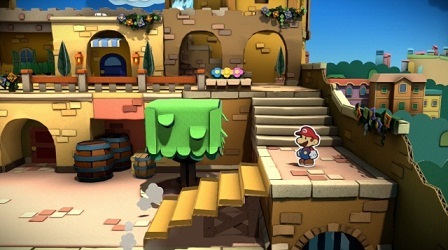 In Paper Mario: Color Splash you have to find out what the secret behind the colorless Toad. You experience a colorful adventure and you have to bring the colors back to prism. Mario and his friends only consist of fine paper, but he turns the nasty opponents and using his Paint Hammer and the Battle Cards he can make all the enemies finished off. In addition, you expect in this cute world numerous puzzles that must be solved. What Are Thing Cards And What Can They Do? In Thing Cards you’ll find three-dimensional objects, such as a fire extinguisher or a fan that just do not exist, unlike the characters in the game of paper. Therefore, these objects are known as "Thing". To obtain a Thing Card, you have to squeeze such a thing. You can use the Thing Cards in battle. Then often something quite crazy happens. During the fight, you can even use action commands with the help of these Thing Cards. Then at the right moment you must press "A" and already you get an "Excellent" for your train. It is then even possible that you can execute further action commands. If you have used a card recently, then you can return to the location and squeeze the appropriate thing again to get the Thing Card. In addition, your full color stock is refilled. You can also buy Thing Cards for a few coins from a shop in Port Prisma. The positive thing about this is that you can then use any used items again immediately. However, keep in mind, that all thing cards are not available at all times.